Los Angeles-headquartered From Lot to Spot is true to its name—the organization transforms unused, vacant lots into vibrant spots of green space and parkland. 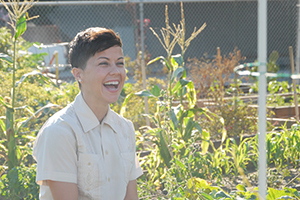 According to founder and executive director Viviana Franco, From Lot to Spot has spearheaded several urban and community garden initiatives throughout Southern California, including several in Riverside. Franco says Riverside hired From Lot to Spot as a partner in building up the gardens, specifically in capacity building and leadership processes. These gardens include Tequesquite Community Garden, Arlanza Community Garden, and East Side Community Garden at Emerson Elementary School. 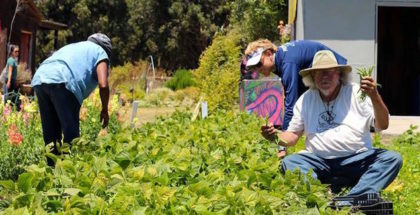 The Tequesquite Community Garden consists of 1.12 acres at Bonaminio Park. Open to all community residents, it opened in June 2013 and offers garden plots. Arlanza Community Garden was spearheaded by Child Leader Project participants from nearby Norte Vista High School, in partnership with the City of Riverside. Also open to all in the community, the effort has revitalized an underused lot in a strong effort of investment for social change. Founded in 1980, the East Side Community Garden at Emerson Elementary School is Riverside’s oldest. 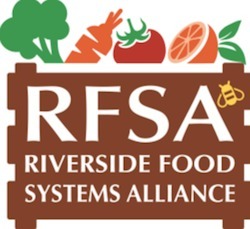 It offers a “garden to salad bar” for Emerson students, and represent a collaborative effort between the school and the City of Riverside. Other From Lot to Spot projects in Southern California include: 118th & Doty Pocket Park in Hawthorne, a community without many parks; Lennox Community Garden, the first community garden in Lennox; Bicentennial Park in Hawthorne, a revitalization project; Larch Avenue Park in Lawndale, another park addition in an area devoid of parkland; Dominguez Enhancement & Engagement Project, a revitalization effort of Dominguez Creek; Stanford/Avalon Community Garden in Los Angeles; and more. While most of From Lot to Spot’s work takes place in the Los Angeles area, Franco said her group will work anywhere they are needed. “There are no geographical limits of low access to healthy foods,” she says. “I founded From Lot to Spot seven years ago out of a need in my personal neighborhood, Hawthorne and Inglewood,” Franco says. “There was an abundance of vacant lots. So I went to school to learn.” She earned a bachelor’s degree in history and a graduate degree in urban planning from UCLA. The efforts of From Lot to Spot are concentrated on low-income communities, “food deserts” with little access to fresh, quality food but an abundance of fast food establishments and liquor stores. Franco said that this problem impacts many African-Americans and Hispanics, and often results in obesity and associated diseases such as diabetes. “From a health and sustainability standpoint, local food is intrinsic,” says Franco, who sees links between green spaces such as parkland and access to good food. These associations include more health and walking benefits and a greater awareness of the importance of diet to health. Also, she believes that both community gardens and parks strengthen their respective local economies by increasing home values of which the business community takes note. “I call it a great green circle,” she says. Franco acknowledges that parks are often at the bottom of the barrel of many cities’ budgets, but she firmly believes that parks and gardens bolster the tourist economy and increase connectivity between neighborhoods. Despite the successes enjoyed by From Lot to Spot, Franco says the journey has not been without its obstacles—chief among them are bureaucracy and the difficulty of coming into a new community, where people may wonder what will be done with a vacant lot. Timeliness is also an issue, she says, as it can take a long time to convert an area into green space. “We’re not there yet,” she says. So how is “there” defined? According to Franco, the future goal, at least for right now, is 20 more green spaces by 2020. She hopes to attain this goal through From Lot to Spot’s many partnerships, which include Los Angeles County and numerous Southern California cities. An unexpected partnership was one with the Los Angeles County of Public Works she was surprised that engineers would want to work with environmentalists. 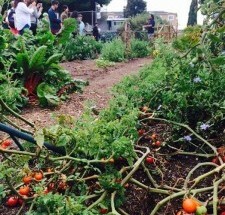 From Lot to Spot is committed to fostering urban agriculture, says Franco, who is working hard alongside her From Lot to Spot colleagues in increasing local food access in Riverside and throughout Southern California.